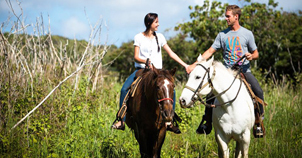 Kualoa Ranch offers guided 1 hour and 2 hour horseback riding tours that take you through beautiful forested areas with views of lush mountains, valleys and the ocean. 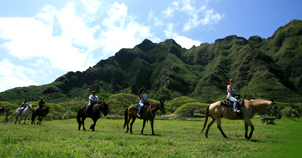 Take your sweetheart on a romantic 2 hour guided horseback ride into the mountains on Oahu's scenic North Shore. Includes a delicious picnic lunch! This 1 hour Advanced Trail Ride provides the opportunity for trotting and cantering. Great for experienced riders who are very comfortable in the saddle. This horseback adventures is great fun for kids between the ages of 2 and 7. They may first pet and brush their horse and are then taken for a pony walk on the ranch. Choose between a Scenic or a Sunset Ride at Gunstock Ranch. Both horseback riding tours are walking-only rides and are great for riders of all skill levels. Saddle up and hit the trail! 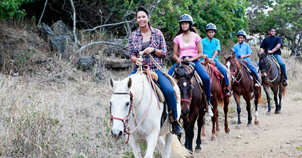 Get ready for an Oahu Horseback Riding adventure in the remote areas of Oahu, but still not too far from Waikiki and Honolulu. Imagine a horseback ride through cool forests, thriving ranchlands, and tropical orchards on a hilltop overlooking Waimea Valley on Oahu's North Shore where ocean and mountain views provide a gorgeous backdrop to the trail. Or perhaps you'd prefer a slow gallop on Windward side of Oahu where riders tour one of the island’s oldest and largest ranches past World War II bunkers, through deep forests, and finally into historic Kaaawa Valley, which is lies between three of the most imposing peaks on Oahu: Puu Kanehoalani on the southeast wall, Puu Ohulehule at the valley’s head, and Puu Manamana on the northwest wall. 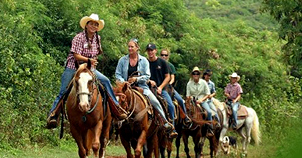 Any level rider is sure to enjoy Horseback Riding in Oahu, but be sure to book in advance, because this popular and growing activity is often full by the day of the ride. 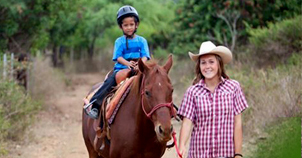 Choose a horseback ride from the right for more information or to order. There are many other Hawaii Activities and Hawaii Tours to choose from such as Hawaii ATV Tours or start your Hawaii vacation off with a lei greeting. One of our lei greetings will put a smile on your face and start your Hawaii Activities off with a great start. Just call us at 866-482-9775 or visit us at www.Hawaiidiscount.com for all the Hawaii Activities offered! Copyright © Oahu Horseback Riding 2019. All Rights Reserved.